She looks so beautiful in this dress! She wears like a princess, most of her clothes are very regal!! She looks like a doll. I am amazed how good carderope she has had so far on this tour, only one failure in my counting. No reason at all, she looks picture-perfect! This is not a formal gown. This is a beautiful piece creatively speaking. Let's be honest, the purpose of this tour is to introduce Meghan to the people and to add enough of a 'wow' factor to make it memorable. She also spoke at this event, another reason to have a memorable dress. I agree with chardonn8r. This is not a formal gown. That’s a spectacular dress. Meghan has found her mojo. That is a beautiful dress, but seems a bit 'ball gownish' for the occasion in comparison to what the others wore. That is exactly what I just wrote on the Daily Mail. 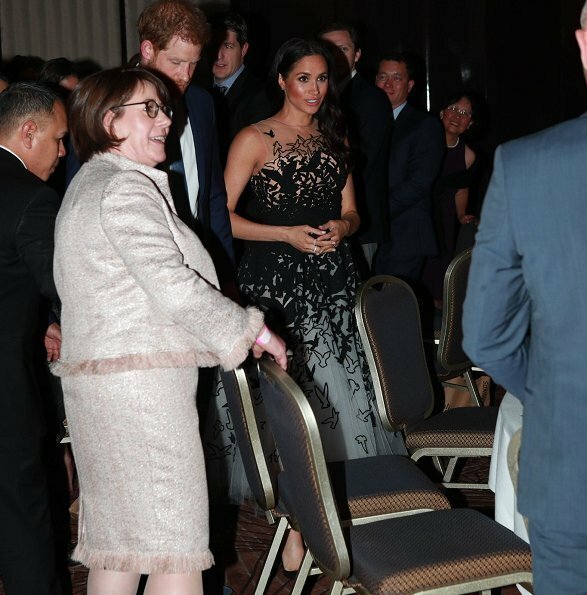 The men and women in attendance wore business clothes and Meghan dressed for a black tie event. $10k is excessive an expenditure on a dress for this event. Perhaps she dressed with an award ceremony in mind. 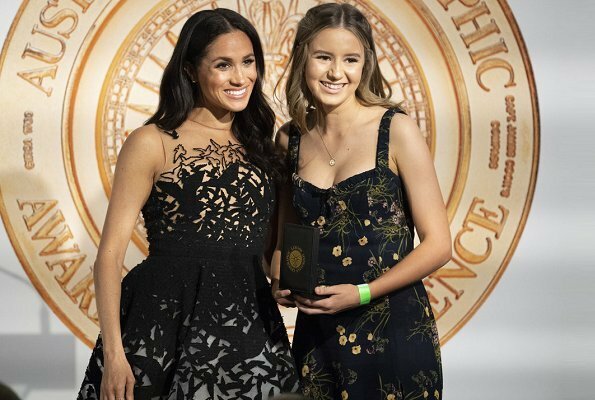 The first award recipient wore a beautiful evening dress and has a great picture with Meghan both looking dressed up. That girl by the way is stunning. Smart and beautiful!!! I would like to see something different on her hair, but,she looks so sweet, I like it! Love it! She is gorgeous! That dress is fabulous! I love her style. Yay DofS! I love this dress, very feminine and away from the straight A line that she generally favors. Lily, I think this dress is not too ball gownish if you are giving away a prize like this in the evening hour, for one thing she is the royal here, ( please insert Máxima , Mathilde and what they would have worn for this occasion) , and unfortunately people do dress down nowadays for almost any event, but looking at the young lady receiving the award I can tell that she thinks the event is formal enough to wear a cocktail dress. well said, Cherry Blossom. This is an awards GALA, not just a regular evening event. And there are others dressed accordingly. I think this is Megan's "outfit of the year" - before my favourite was the navy Dior dress she wore in the summer at the RAF event. It's rather telling to sit back and observer that no matter what, some folks will strive to find something negative to sy (it's too casual - now its too dressy; too dark - now it's too bring... fill in the banks - but there's ALWAYS something that doesn't please them; I wonder how the review of their own outfits in the morning before heading out goes... can't fathom the "internal" conversation whilst looking in the mirror; must be quite something else). 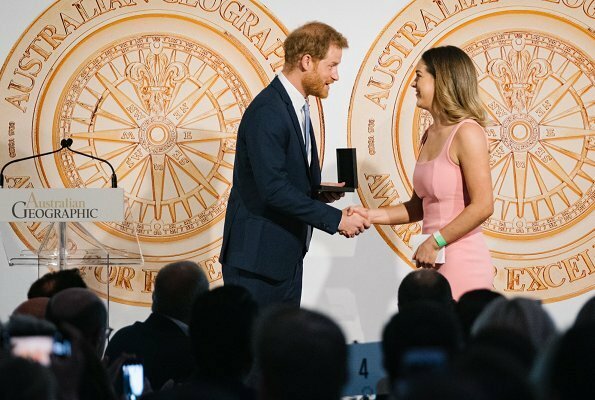 Anyway, positive thoughts from me - Megan is a lady and a great one at that - she makes Harry so happy ("my wife and I are very pleased to..." is how he starts his speeches, I am sure we all noticed how his eyes glow as he says these words). Whether we love (or not) their sartorial choices, these is no double this couple shows the world what a true leading family looks like - what they value, how they behave, how they inspire an entire world. I'll say we're all blessed to have them in these particularly challenging times. Some of us may recognize it and some not. But the blessing is still there. A lot of contrast in her wardrobe for this trip. Lovely dress, maybe even spectacular, of course, but I have hesitations as to whether it suits her; I like it on the model. Ibove the dress and how it looks on her. I agree that she looks a little overdressed though.but rather over dressed than under. I have to agree with the "ball gownish" comment above. This is a cocktail /awards party where some people look like they came directly from work and are dressed in professional work clothing. Also, the price tag (£10,000!!!) is bound to draw negative comments and criticism. Pretty as it is, I would have saved it for another occasion. I just can't get behind this look overall... she is overdressed and her body language is uncomfortable. The dress in itself is pretty and has an interesting underskirt, it's just not as spectacular as I would expect from the hefty price tag. Maybe the dress is just really not to my taste, but I prefer a classy, polished look and not a princessy one. Adding to the awkardness are shoes that are far too large. On a non fashion note she looks tired, which is completely not her fault, but it doesn't help. schoenen lijken steeds te groot omdat Megan abnormaal magere onderbenen heeft. Her legs are thin, yes, but she actually wears shoes that are a size too big on purpose. Folks have speculated that larger heels reduce pain on the feet, but it just looks awkward to others. Beautiful dress! But, is it too much for the occasion? Fabulous - a real princess dress. She looks lovely. I’ll admit really, I’m not a fan of Meghan for a lot of reasons I’ll keep to myself as this is a fashion blog. When I saw this dress, I was honestly wowed. But like the comment above, I think it’s too much in comparison to what everyone else is wearing. Fashion: 100/100, the rest? No comment. Totally agree. Not a fan of Meghan. Beautiful dress, but wrong occasion. I find this dress amazing, as are most of Oscar de la Renta gowns. and not everybody in attendance is wearing business clothes, and I agree with Cherry, Maxima wears evening gowns for morning events and nobody finds it wrong because she always overdressed. Agreed. 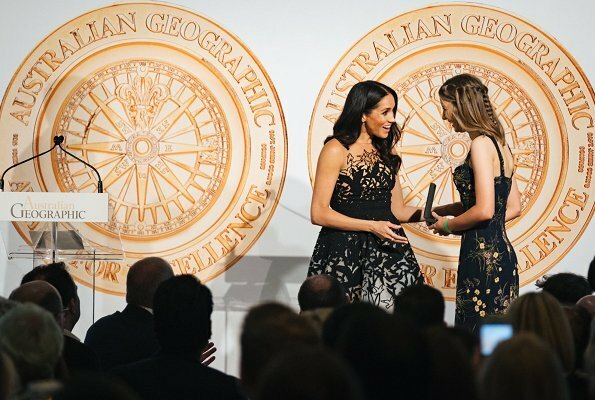 The person she presented an award to was also wearing an evening dress. I don’t why my comment didn’t go through the first time, bus as I said this is not a princess dress this is a Hollywood dress, I kind of like it but st the same time I don’t. d) The entire look is a bit too ballgown-like, and she looks overdressed compared to the other people I can see in the photos. It´s not a terrible dress, but I don´t get the wow-effect everybody else is having. Me neither, I don’t get the wow- effect either. are a lot of women wearing evening gowns. I loved the top part of the dress, then I saw the rest of it. Perhaps a bit too white and see-through at the bottom. Fine line between lovely and tacky. I prefer it on the model, it seems to hang better and is less puffy/pouffy. I am also so over those bow-tie shoes. Meghan needs to work on her "royal" body language and also stop playing with her hair. Stop leaning down and in to people! You're married to a royal, learn how to carry yourself! And yes, why is she so overdressed compared to the others. Have we run out of topics to criticise her on? Now it is "royal" body language? I really find the comments about how much she spends on any particular dress, so incredibly judgmental and biased. Firstly if she receives an assignation from the Crown, she can spend it as she pleases, also she is not a poor woman, she has her own fortune, and so does her husband. Secondly I rarely see all of these anonymous contributors,stating the same about Kate, Máxima, Matilde, Madeleine, not to mention the Monaco house. I am glad to see that she considers this event important and inspiring enough, to wear her best. On another note, for all we know, she could have gotten this dress at a very, very discounted price ( that's how many designers work) . Let's please get off the pulpit and start talking about the theme of this fantastic forum. Your comment is so spot on. I find it also unfair and biased how some scrutinize how she spends on her wardrobe. I mean royals are given allowance for their wardrobe. It is up to them how they want to spend it. And as if she can't rewear them, well of course after her pregnancy. She is not the only royal who spends that much. I wonder, if Kate perhaps have worn this dress, will the price be a big deal? I've seen some posts tagging Meghan's wardrobe more than what it is worth. Some posts even make it appear that her bags, shoes & some jewelries (she have worn before she became a duchess) are newly purchased. Why so biased? If this will go on, maybe Meghan should go for more bespoke dresses in the future so that the prices are not available online and people will not make a big deal out of it. A couple of things you should know. 1. The British royal family do not accept free clothes or discounts on clothes, and 2. The BRF and most other royal families obtain clothing as part of their official budgets and hence generally do not pay for them out of their own pockets. Charles pays for these expenses for his daughters-in-law though his income from the Duchy of Cornwall. The British public has an interest in this type of expense because while the Duchy affords Charles an income, he does not own the Duchy outright, it is part of the Crown (i.e. belongs to the public). I think we focus on the clothing budgets of the BRF more often in part because the tabloids tend to point out the costs of their wardrobes, while other royal families do not get this media scrutiny. That being said, two royal women in particular - Letizia of Spain and Victoria of Sweden - tend to keep their clothing budgets relatively low due to budget constraints and public sensitivity in their respective countries. Those two women prove that it is not necessary to spend extremely high amounts to look beautiful and appropriate. Meghan is outdoing the amount spent by Kate by a mile, and I think it is fair for the British public to give her flack for this. She may well have her clothes paid for by the Duchy of Cornwall but she is a wealthy woman in her own right and is entitled to spend what she likes on her clothing. She is also at the beginning of her "royal career" and so is still in the stage of building a wardrobe - we may well see these items repeated in the future. Actually, Catherine spends a fair amount on her clothing - and was asked by the Queen to stop being quite so "high street". The Duchy of Cornwall may well belong to the Crown but it makes its own money and it is not the taxpayers paying so the British public really have no reason to beef at all. @Franny, regardless of her wealth, Meghan is still not spending it on her official wardrobe. Your second comment sounds like one of the lies published by the tabloids. The Queen would likely never say such a thing and if so a reporter would never be in the room. The British public have a strong moral right to complain if something if something upsets their sensibilities. Ultimately, the royal family exists only at the public's pleasure, and the royal family knows this (Prince Philip has even been interviewed stating this fact). Well, the supposed comment from the Queen wasn't from a tabloid - as I don't read them - but from a reputable newspaper. Clearly I can't say whether it's true or not but neither can you. It was published around the time the Duchess started spending more on her wardrobe. People can complain about what they like - and when it comes to royalty they inevitably do, justified or not. I don't agree it's a moral right to complain in this case - her clothing does not cost the taxpayer. Actually, we don't know who has paid for Meghan's wardrobe - we can probably assume she has the same arrangement as Catherine. And in my personal case, as a British taxpayer, my sensibilities are not offended by the spending of money which I have only contributed to when I bought a packet of Duchy of Cornwall biscuits. She is representing this country abroad and I think she needs a wardrobe for that. As I said, she's still building her wardrobe so would hope to see some/all of these outfits in the future so I really think it's a bit early to be criticising her spending. @Franny, fair enough that you don't mind the expenses of the royals, but many British people do, and they certainly do have the moral right to object... particularly given that, as I said above, the Crown exists solely at the pleasure of the public. This should not be a contentious argument, especially given that the Monarch is the unelected head of state of a democracy, and therefore there must be some method of accountability of the Crown to the public. Hence, the Queen's subjects have the moral right to object to perceived opulence. This type of public check on a monarch is particularly found in Spain, where there are pronounced economic problems and hence the King has responded to his subject's concerns by practicing austerity. His wife, Queen Letizia, is known for dressing well but keep her budget relatively low. To answer your other point, there has been at least one official memorandum from Clarence House specifying that Charles meets all the official expenses of his sons and their wives. This includes clothing for official functions. Now you know who pays for Meghan's outfits. I'm thinking about if she fired her stylist after the first view days of the trip. Most of her styles are really better now these days. These style here is unique, not 'usal' but appropriate and nice. But I still think, her dresses for the state dinners were a bit to casual. Meghan has never been to a state dinner. and btw, this is an award show, imho Meghan is not overdressed, others are underdressed. What a gorgeous gown! 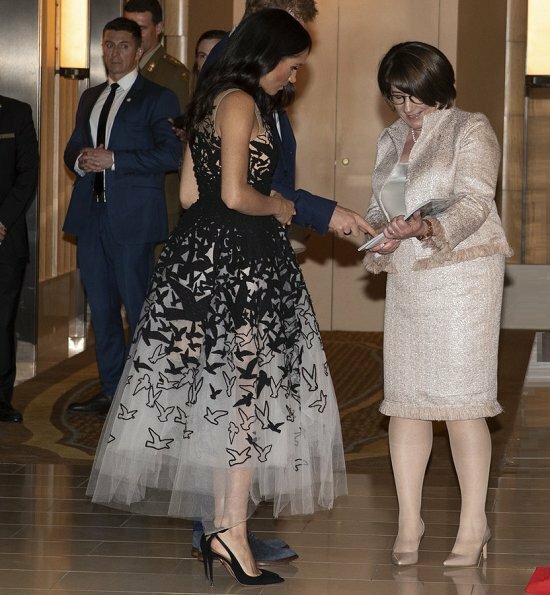 It is perfect for the occasion and looks wonderful on Meghan. Also like the dresses the 2 young award recipients are wearing. Beautiful dress Maghan looks good in it,but I don't care so much for the transparent material. Maybe for a different occasion it would have been outstanding. Some think it too formal, others just right. Each to their own opinion. The fact is the price of the dress is L10,000, whether she paid, Harry paid, or Charles paid, who knows and the price they paid we do not know. It is also a fact that other people have often voiced their opinion as to Maxima (and others) being overdressed too for certain occasion. Again, they have the right to do so. In my opinion, top of dress is gorgeous, do not care for the tulle and ballerina like look on the bottom. Like the shoes. My favourite dress of this tour! She looks so beautiful. For someone that comes from Hollywood you would think she would know how to dress for any occasion, but most of the time her clothes are a miss for me. I like this dress, but she is overdressed for this event. All of California does not = Hollywood. Actors all depend on stylists to create that once a year red carpet look. Away from that the photos are usually casual. Generalizing much? Wow. A real princess dress. 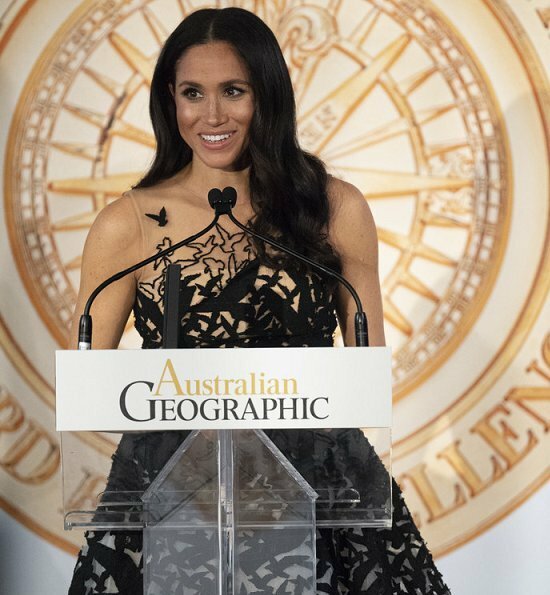 Meghan looks wonderful here, although the dress certainly bulks her up more than a straighter style. Totally agree with all those who defend her right to dress up for a formal awards and far better to see her overdressed than too informal as she has been at a number of events. Some of the women at the event are clearly in cocktail dresses/evening dresses. 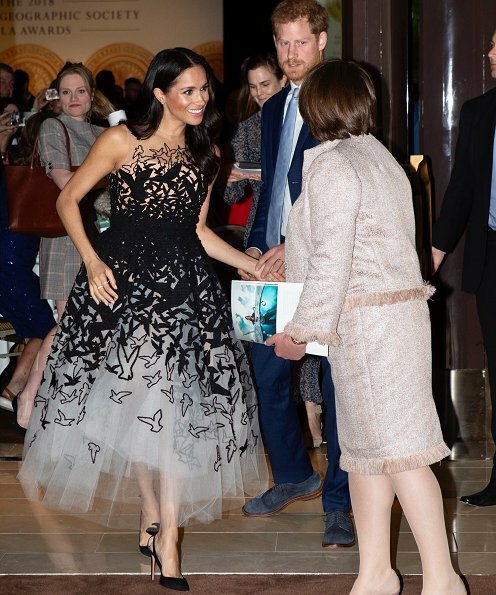 The fact that Harry is not in evening dress would tend to suggest it is not as formal an event as the dress warrants but she still looks fabulous. While the Sussexes are keen to minimise their entourage, I think a proper stylist rather than her pal Jessica, is definitely required before the next tour. This dress is amazing. It reminds me of Greace of Monaco and Audrey Hepburns legendary dresses. Oscar de la Renta really knows how to make spectcular dresses. Since Harrys blue tie and suede shoes have written "casual" all over them he too is more on the underdressed side. Maybe the dress wouldn't have been so over the top if the two had coordinated their outfits better. She is beautiful …… I love her style, also this 'ball dress'! Do not care for this dress at any occasion. Au moins elle est habillée et fait honneur aux gagnants. Je trouve que vous manquez d'indulgence. Cette femme cela fait 5 mois quelle fait partie de cette famille. Elle doit se constituer un vestiaire. Que les vêtements soient chers ou pas cela ne vous regarde pas. Pour le moment elle est encore américaine elle n'a pas la nationalité britannique donc nul ne sait qui pait ses robes et a quel.prix. les tabloids britannique ont une attitude partiale vis à vis d'elle. Lors du diner de gala a Buckingham,la duchesse de Cambridge portait une création d'Alexandre mac Queen aucun prix na été donné . Donc il y a 2 poids 2 mesures. En ce qui concerne la robe elle est habillée correctement. Dans l'assemblée il y avait des gens en tenue de soirée.